Almost every aspect of business operations are moving online — and for good reason. The accessibility and organization which online services offer improves operational efficiency and reduces costs — and as we’ve previously covered, operating costs in the transportation industry are on the rise. 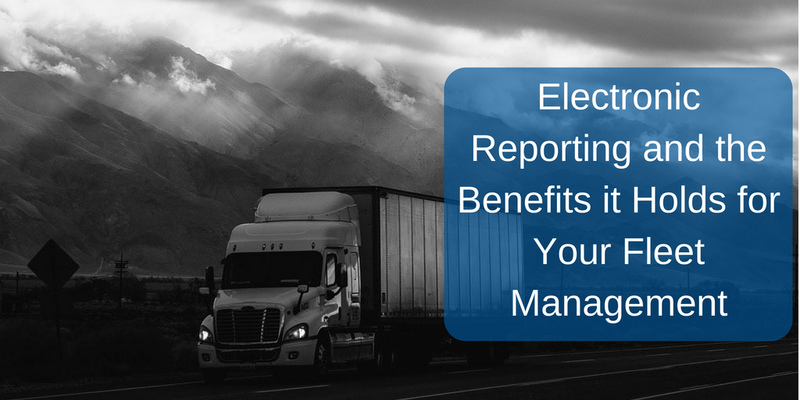 Migrating your reporting to an online platform rather than using paper or other manual methods is a great opportunity to streamline your fleet management and mitigate costly errors that can result from outdated processes. One of the most attractive aspects of electronic reporting — and cloud services as a whole — is access to a centralized location where all business information is stored. At any time, you are able to access your data and information (provided you have the proper security and broadband width to ensure performance). Gone are the bulky file cabinets full of paper run tickets. Drivers on the road are able to store compliance documents electronically so anytime they need to present them, they are easily accessible. Having the storage location online allows drivers to send in reports immediately after a job is completed, giving organizations visibility in real-time. Get up to speed on industry problems and the tools and strategies to solve them with The Agile Fleet Playbook. Electronic reporting also brings with it the potential to reduce human error in your day-to-day processes. Because of the centralized location, documents are less likely to be lost or damaged than if they are physically stored on-site. Messy driver handwriting is replaced with easy-to-read, typed documentation. The automation inherent to electronic reporting also reduces user error. For example, systems of input can be created when handling invoices that automatically calculate fees or sets rates for loads based on geographic location. Systems can cross-check information to verify that it matches other records and is correct, saving valuable time. Naturally, migrating your reporting to an online platform greatly reduces the amount of paper used in the process, thus decreasing your environmental footprint. Even better, with the reduced impact also comes an increase in cost savings — less paper used means less paper purchased and printed. Staff will also spend less time shredding and filing documents. If a document isn’t needed anymore, simply delete it online and the process is done. Give your business an eco-friendly makeover and improve staff efficiency and company overhead at the same time. Migrating to an electronic reporting system will save your company time, money, and headaches. Interested in seeing what a system like this can do for your company? Contact us today and we’d be happy to schedule a demo!